A WHITE TEXAN police officer who says she mistook her black neighbour’s apartment for her own when she fatally shot him has been arrested on a manslaughter charge. 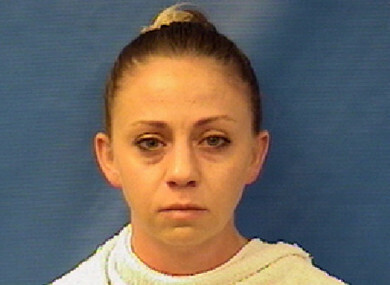 Officer Amber Guyger was booked into the Kaufman County Jail after being taken into custody yesterday, the Texas Department of Public Safety said. They held a news conference last night, shortly before the arrest was announced, making another plea for the officer to be taken into custody and saying their team had presented new evidence – a witness and video footage – to prosecutors. They didn’t provide details. On Saturday, one of the attorneys, S Lee Merritt, said the man’s loved ones weren’t calling on authorities to jump to conclusions or to deny Guyger her right to due process. But he said they wanted Guyger “to be treated like every other citizen, and where there is evidence that they’ve committed a crime, that there’s a warrant to be issued and an arrest to be made”. Dallas Mayor Mike Rawlings tweeted a statement last night in which he thanked investigators, asked for continued prayers for Jean’s family and said he appreciated that citizens and community leaders “were so respectful of the investigative process over these past few days”. Police Chief U Renee Hall said the day after the shooting that her department was seeking manslaughter charges against Guyger (30), a four-year veteran of the police force. However, Hall said on Saturday that the Texas Rangers, who have taken over the investigation, asked her department to hold off because they had learned new information and wanted to investigate further before a warrant was issued. Many questions remain about what led her to shoot Jean. Hall said the officer’s blood was drawn at the scene so that it could be tested for alcohol and drugs. Investigators haven’t released the results of those tests. Jean’s mother, Allison Jean, wondered whether race could have been a factor. Her son, who grew up in the Caribbean island nation of St Lucia before attending college in Arkansas, is black. Jean wasn’t the first person shot by Guyger. She shot another man, Uvaldo Perez, on 12 May 2017, while on duty. Perez got out of a car and became combative with Guyger and another officer. A struggle began and Guyger fired her Taser at Perez, who then wrested it away from her. She then drew her gun and fired, wounding Perez in the abdomen. Sergeant Mike Mata, president of Dallas’ largest police employee organisation, the Dallas Police Association, on Saturday called for an “open, transparent and full investigation of the event,” the Dallas Morning News reported. He described Jean as an “amazing individual” and said that “if the grand jury deems necessary, this officer should have to answer for her actions in a court of law in Dallas County”. “Botham did everything with passion,” Allison Jean told the prayer service. Email “Texas officer faces manslaughter charge after shooting neighbour in his own apartment”. Feedback on “Texas officer faces manslaughter charge after shooting neighbour in his own apartment”.